Would you look at this pretty dog? Adopting through BRAT, "adopters receive a dog that has been spayed or neutered..., fully vaccinated and tested for heartworm and strip-tested for Fanconi (negative unless otherwise noted), and temperament evaluated. In addition, BRAT provides free lifetime post-adoption counseling to help deal with behavioral issues. Finally, we provide a free lifetime identification tag connected to our "lost dog" toll free number." Pretty impressive support system there, yes? If you're interested in adopting Laini, hop over to the B.R.A.T. website for more information about her. Hey Laini Jet here. Good luck, we hope you find your forever home. Our basenji friend, Arnold, lived until 14 across the street. His humans never took him out for a walk around the neighborhood, but loved him and played with him in the yard. We often heard his yodels! "...free lifetime post-adoption counseling" How cool is that? OMG, she is gorgeous! Duke would love a brindle sister, but Maggie would have none of it. 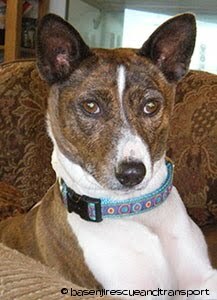 Originally someone at Buddy Dog thought that Maggie might be part basenji since she wrinkles her forehead with her ears up at times. Laini is beautiful & sounds like she would fit in well in most families. Hope her family finds her soon! Yay Laini! I agree, this one's a real looker... and her profile sounds wonderful. 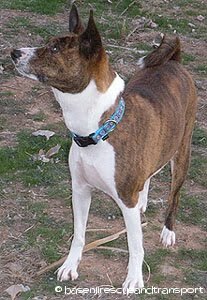 We were lucky to score a "mild" adult Basenji as our first rescue. I couldn't have asked for a better breed introduction. What a cute dog!! Paws crossed that she gets a furever home quick!! Laini is gorgeous! Good luck! She is beautiful & you know we LOVE her ears! Hoping she finds her forever home soon. I've got my paws crossed that Laini finds her forever home soon!! Thanks, Nola. She is a pretty one, isn't she? Hi! Thanks for visiting - love your dogs! She is a pretty girl, isn't she? She'll get home soon, she's too sweet to not be noticed.